* Car and Driver, 4 speed Manual transmission. Location: Stamped on the plate which is riveted to the driver’s side of the dash, visible through windshield; the certification label is located on the the rear face of the driver’s door. The 1979 Ford Mustang was once again selected as the Pace Car for the Indy 500. 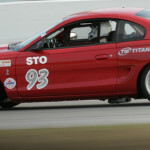 It was the 6th time a Ford was selected to pace the field of America’s then premiere race, and the second Mustang. The three original Pace Cars were specially prepared by Jack Roush, after completing duties at the Indy 500 the cars were repainted (white) for service in the Detroit Gran Prix that same year. They now sit patiently in Roush’s warehouse awaiting restoration to their original livery. The actual pace cars were fitted with T-Tops – an option that wouldn’t be available to the Mustang until 1981. The production Pace Cars were finished in a two-tone pewter and black with orange commemorative graphics. Engine choices for the Pace Car were 2.3 L Turbo 4-cylinder and mandatory four-speed manual transmission, or the 302 ci V8 with either the manual or three-speed automatic transmission. Jackie Stewart piloted the actual Mustang Pace car for the start of the 1979 Indy 500, while Jim Rathmann took over pacing duties during caution periods throughout the race. 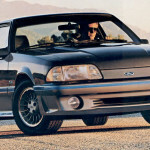 A Mustang would not be selected again to pace the field until 1994 with the Cobra convertible. Pace Cars: 5,970 2.3 Turbo with manual transmission 2,106 5.0 V8 with automatic transmission 2,402 5.0 V8 with manual transmission. 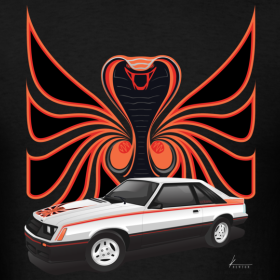 Cobra T-shirt $23 while supplies last. Click for sizes and shirt colors. The Cobra was available with the 2.3 L Turbo four-cylinder or the 5.0 L V8, a four-speed manual transmission, and 3.45 final gear ratio. Suspension modifications included HD front and rear sway bars, special shock-valving, and 15.35” (390mm) forged aluminum wheels wearing 190/65R Michelins. Sales materials promised 0-60 performance of 7.1 seconds. Inside the car featured the Cobra insignia on the instrument panel, an 8,000 rpm tachometer, ribbed door trim insert, and special instrument panel lights including an audible overboost and engine oil temperature warning system. A total of 17,579 Cobras were sold in 1979. With sales numbers like that, it’s surprising that we don’t see more of them on the road.